In glacial ages more of the earth's water was locked in polar and mountain ice caps, lowering sea levels. 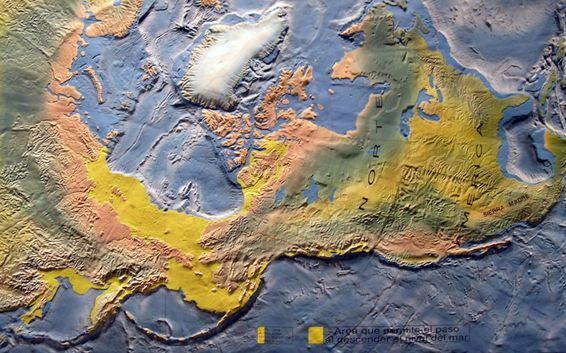 The lower sea levels exposed additional land area along the coasts of the present continents. This coastal land, now below the surface of the ocean, was home to populations of plants and animals which, in the normal course of their lives, came to be distributed over wide areas, some of them separated by water today. The Bering Strait is today a relatively shallow body of water between Russia and Alaska. It partially dried up in some of these periods, producing a vast stretch of land that united northeast Asia with the Americas. The region was home to a wide range of cold-adapted animals and, at some periods, human beings. This body of land is referred to as Beringia. (External Link) At times of lowest seas, it was about a thousand miles from north to south (roughly the distance between Ottawa and Winnipeg or between San Diego and Seattle). Because this land lay across the modern divide between Eurasia and the Americas, it is also called the "Bering Straits Land Bridge." Some of the plants and animals living there (including people) are said to have "migrated to the Americas from Siberia" by this "route," even though they themselves probably had no sense that they were doing anything more than minding their own business and foraging on the now-vanished landscape where they lived. Most early human populations of the Americas are descended from the peoples who lived in Beringia and, over the course of generations, "crossed" Beringia, so that when the waters eventually rose again, their descendants were dwelling on the American side. Part of our reconstruction of the peopling of the New World therefore depends in part upon knowing the periods when Beringia was above water and available for habitation. At other periods glaciers covered the Mackenzie Corridor, but not the western coast of the North American continent, which provided a potential coastal route for possible migration, either on foot, or in part using simple water craft and living on coastal sea resources. Once again, there is little evidence that such a route was in fact used. In the case of the coastal route, we might expect that any scant remains of prehistoric coastal settlements would today be under water, since the modern higher seas would have covered the old coasts, so it is hard to imagine that we will ever have solid evidence for this path of migration. One attempt to study the coastal terrain of this area as it was about 10,000 BC used a bathymetric map to locate areas for submarine sample collection which could be Carbon-14 dated. This provided evidence of coastal forests that had covered the area by that time, even though a couple of thousand years earlier it would have been frozen. One stone tool was even recovered dating from about 8,000 BC from a level 53 meters below the present sea level. In 2018 human footprints discovered on Calvert Island, British Columbia, were dated to about 11,000 BC, the earliest known human footprints in North America. These finds suggest continuing human populations in these coastal areas, and increase the probability of a model that would see the coast as also having been an early "migration route" into the Americas. The following dates summarize the availability of unobstructed routes for human migration southward from Beringia during the ice age. During the "warm" periods of melted glaciers and high sea water, when Beringia itself was submerged, naturally both the coastal and inland routes were ice-free. Although the chart suggests a binary "open" and "shut" distinction, this is too simplistic: "Open"is not always equally inviting, as the variation in sea levels and coastal woodland ecology clearly shows. From the paleoclimatological information given here, it looks as though the coastal route hypothesis is stronger than the inland route hypothesis, and as though the "smart money" would be on the period 22,000-15,000 BC as the most probable time for this initial migration, with 38,000-34,000 as a provocative early-end hypothesis. If we combine the paleoclimatological dates with the linguistic-genetic dates, we notice that the inland route was "open" about 4,000 years earlier than the time when the linguistic and genetic "clocks" said these events would have happened. One view is that this might be the result of some kind of error in fixing dates for the linguistic and genetic evidence, or it could simply mean that a newly opened route wasn't immediately populated. With these changes in our understanding of genetic evidence, the linguistic and genetic dates still fit well with the history of coastal route accessibility, but fit better with the history of land-bridge availability. Further genetic studies in 2012 suggested later dates, with more rapid spread once populations were established on the American side of the Straits. However, studies based exclusively on DNA evidence sometimes produce models that do not seem readily compatible with geological or linguistic evidence. (2013 Example) visits since 161003.